Service Costs > How Much Does it Cost to Move a Mobile Home? 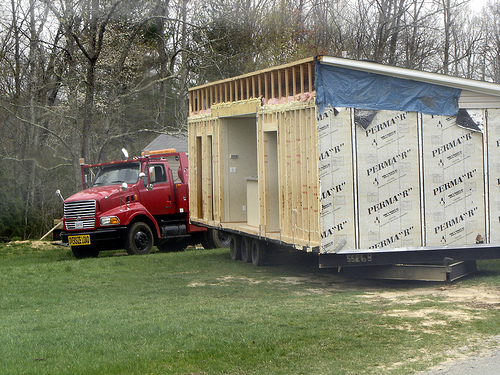 Moving a mobile home is necessary at least one time — moving it to the site after it has been built. As you know, mobile homes are not built on a site like houses, but instead, they are built at an offsite location and then transported to the location of residence. The nice thing about a mobile home is that, unlike a traditional home, you are able to move it just about any time you please. While the process can be time-consuming, it is also going to come at a price. Moving a mobile home may be done during the initial purchase of the home or if the owner decides to move to a different plot or park. The price of moving a mobile home is going to depend on the company, the distance of the move, the size of the mobile home and geographical location. On average, a short mobile home move that is less than 100 miles will typically cost anywhere from $2,000 to $5,000. This would be the range for a single-wide trailer. For double wide or triple wide trailers, the prices can significantly rise. For moves over 100 miles, plan on spending around $6 to $15 per mile. This is going to be for the transportation only. Aside from this price range, there are a lot of extra fees that you will have to factor in. Refer to our “factors” subheading below to see what is going to affect the price. A full-service move, which will include everything from disconnecting the utilities to setting up the mobile home at its final destination, can cost anywhere from $3,000 to $6,000 for a single-wide trailer moving less than 75 miles, whereas a double-wide could cost up to $15,000 for a double wide. If the move is longer than 75 miles, then it’s best to tack on another $5 to $7 per mile. A forum thread on BiggerPockets.com noted that if you are traveling within 20 miles, plan on spending around $2,000 to $3,000 for everything, including the fees and permits. Moving.com says the average single-wide trailer move, from transporting the home within 50 miles to hooking up the utilities and acquiring the permits, can cost around $8,000. A double-wide home can cost closer to $13,000. What kind of foundation is the mobile home sitting? A slab is going to be cheaper than a block foundation. How much does the mobile home weigh? The more it weighs, the more it can cost. How long is the move? Obviously, the further you have to go, the more you are going to have to pay. The states through you are going to drive as each state will have its own oversized load rules, and every time you enter a new state, a new permit will be needed. How big is the home? A double or triple wide will cost more than a single-wide. What is the route like? Is it mainly highway? Do you have to drive through busy towns that can alter traffic? Before the company arrives, all belongings must be removed from the home. Once everything is removed, the electricity and any power lines will be disconnected from the unit, and upon removing all incoming wires and pipes, the skirting will be removed and the trailer will be jacked up on blocks. Once jacked up, the tires will be inspected to make sure that they are operable. If they need to be fixed, this is the time to do so. When the structure is inspected one last time, it will be loaded onto a trailer bed and will head towards its destination. A transit-only move should include, at a minimum, the permits, insurance, vehicles to help guide the semi truck, hookup and unhooking at the final destination. A full-service move will include disconnecting the utilities, skirting and attached structures. In addition to this, any connections and setup required at the final destination will be implemented as well. Depending on the distance, many states are going to require special oversized permits, and most providers will consider this an additional charge. If you are traveling through more than one state, you may need to get a permit in each one. Mobile homes that are settled in the ground with landscaping around can cost more than a mobile on a standard slab in a mobile home park. If you want the company to remove the skirting, deck, steps and landscaping, this can be an additional cost to consider. The mobile home will more than likely need wheels. Upon arriving, an inspector will check the condition of the frame and chassis to determine if the axles are capable of traveling. If there is tire damage, it can cost up to $50 per tire to repair. Axle damage can cost upwards of $150 per axle. If any repairs are needed before the move, such as issues with the structure of the home, most companies will require that you fix the problem before proceeding. Once you have arrived at your destination, companies are going to charge a setup fee that can cost anywhere from $1,000 to $5,000. This will depend on the size of the trailer and the set up of the plot. Tear downs can cost the same as setting up. Escorts that follow the truck can cost an additional $1 to $2 per mile. These are the trucks that you usually see driving in front and/or behind the mobile home warning other drivers of the large load being carried. Ask the company how they are going to retrieve their permits. What you are going to find is that some may require you to get the permits on your own, which could be a lot of work. With any professional service, be sure to compare and talk to at least three companies before making a decision. Always make sure that the company is licensed. If they are not, your mobile home insurance may not cover any claims made as a result of the move. Not all companies will be created equally. When choosing a company, make sure they have the capacity and equipment to successfully transport the home. Also, it’s so important the company is properly insured when crossing state lines. Sometimes moving just does not make sense in the long run. Be sure to compare other options such as selling your current one and buying a new one. With so many options out there, most will recommend that moving be your last option. If yo are in the military, the government may be able to help you with your move. Talk with the movers to get more information regarding this. Compare quotes and talk with at least five professionals. When getting a quote, just make sure they are insured with the move.